Match reports from League Round 8 below. The best thing about being late to away games at the Uni grounds is scoring an excellent car park. I jogged over to the team puffing and panting as if I’d run from 2km away and apologised before joining in the warm up. So far so good. We started okay, but given our mantra was “first 15” we could have considered our intensity a little low. We created a couple of ripping chances, which collected an upright and a crossbar, and began to control play, but to no scoreboard advantage. I can’t even remember how they put away their first goal but I think it was through lack of pressure on multiple lines. 0 -1 Uni. We continued to control play for the most part, and Cookesy made a ripping header finish to one of Mike’s trademark pinpoint set piece balls – slowly becoming a strength of ours via game day practice and a solid setup from Keith. Half time 1 – 1. We maintained and perhaps even increased our pressure in the opening of the second half. I found a bit of space on the right care of a Daniel Porter clearance and as I was about to make my forty seventh bad pass for the day I saw Tricky in a dangerous spot at about 18 yards – so I hit my only decent touch for the game into his waiting arms before he dinked a cute little header over the keeper. 2 – 1 Unley. 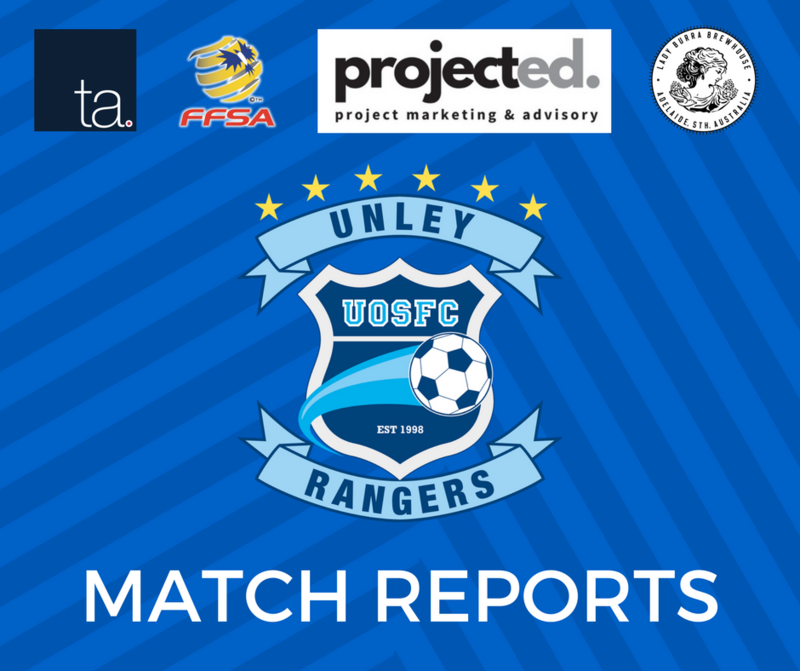 Big Rig slapped the ref and got sent off at about 70 mins (not really Griff, just two yellows for bad tackles) and we conceded an ungainly own goal a few minutes later… Porter was really annoyed because he’d played a cracking game to keep a couple of balls out of the Unley net. A frenzied finish with numerous turnovers and a couple of chances both ways finished in nobody’s favour and we took a point home with us. Note: We conceded three own goals! Uni White have been something of a thorn for Unley 1B over the last few seasons… and so it proved again with a less than desirable result. Alas injuries and some unlikely/comical defending (as a team) and some records (in own goals) proved to be more than enough to undo the great work of the opening half. Rangers began in an upbeat style, Griff and Ali made up the least agile centre-midfield partnership in the league, Bell put his hand up to keep after some impressive training sessions between the sticks and the partnership of Ari and Jordy continued in the centre of defence. Will Longshaw made his long awaited debut after a protracted transfer of several months from Sturt Lions FC. His inclusion proved to be remarkable coupling excellent hussle in midfield with two OG (and a yellow card). The boys tried to make things happen but as the game wore on Whites took advantage of injuries to key players; first Ari, then Griff and Jack Power played through the pain after 65 odd mins. Late on a penalty was won by Bacelle, from memory; Grosskreutz then pulled ranked and duly dispatched the spot kick with aplomb. The mood amongst the players was generally positive despite a bruising result. It’s easy to imagine without the injuries and three unfortunate own goals (which only came about from great last ditch defending) that the score line or possibly even the whole match might have been different. Whites simply took advantage of what was in front of them. Credit to them. After the match the 2s agreed on a specific training night, and, with more than half the season left plenty of time to notch up some positive results. Scorer(s): Ryan Stor, Justin Kennedy, Zac Goodwin & Roshan Wilson. We arrived to the game Saturday looking to continue our assault on the league. There was plenty to be up and about for as we celebrated the achievement of 250 games of kickball for a bloke named Kenners. Some refer to him as a top guy, legend or jerk, you be the judge, but go Troy MAFS. The Div 4’s started brightly and with intent as we attacked hard and kept control of the game. Five minutes in, we win a corner. As Howey delivers a brilliant cross Kenners rises above the pack for a net busting header and celebrates with a ‘that’s how ya do it boys!! !’ to rev the team up. 1-0 Moments later our high pressure allowed a build-up on left through Parksy and Greeny, which led to a through ball to Story who finished far post across goals. 2-0 We kept playing attacking football for the majority of the half before easing off the pressure, and off the back of one their corners a young fella with different colour boots scored a shot-cross to make it 2-1. Then in an innocuous incident, Parksy went down with an ankle injury after playing an intense first part of the game. After the half time chat we wanted to keep things tight and keep pressing to maintain the ball and create turnovers. This had some impact as we lifted and kept our passing fast and slick. Apples made an appearance on one ankle the other resembling a loaf of bung fritz. Still managed to grab a slice of cheese for his efforts. Uni White tried to ramp up their attacks and forced Porter into some great 1 on 1 saves and one out of top corner kept them out of the game. As we fought back a young fella with good knees, hamstrings intact, and yet to dish out his first finger bang in the corner of Zhivagos, penetrated the box like a pro and put it away to make it 3-1. Late on they pinched one back on a through ball wide and a finish from corner of 6 yard box which got their tails up. 3-2. This next bit is a blur as we had kick off and then…..enter Roshan ‘#messi10’ Wilson. He receives the ball on the right and cuts in, beats not one, not two but about 5 blokes, one with a headband, and calmly slots it bottom corner to get the good guys home. Then Kenners nearly killed a bloke….ref blew the whistle and we sung loud, Kenners forgot his part at the end of the song. We laughed. Twas a delightful Saturday afternoon, the 5s were to kick off at their new favourite timeslot, 3pm. After struggling to park (obviously a Uni White tactic to throw us off) we all assembled ready to play. Gareth had a new plan, one we liked. Attack, apply lots of pressure and play a very high line. Put them under from the start and rattle them. The tactic worked, the opposition had no time on the ball and Unley were all over them. Dispossessing in their half and on the rare occasion it went into ours we sent it back with force. We had many many chances that unfortunately we failed to convert. This was ll in the first 10-15 minutes! Things happened the rest of the game. After the game, a few of us went to the pub for a beer. Also, a Match Report below from League Round 7 (only the Div. 5 submitted a summary). Unley Rangers could not have asked for better conditions when they hosted Mt Barker on Saturday. No wind, not a cloud in the sky, a perfect day to play football, you could have easily been forgiven for forgetting that it was the start of winter. After a disappointing result in spite of a gutsy effort last week, the team was eager to bounce back with a win against Mt Barker. 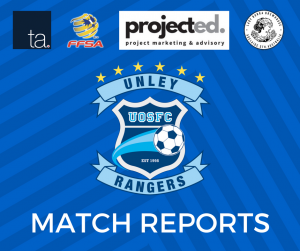 The first half saw a strong performance from Rangers, we pressed well and worked the ball into plenty of threatening areas, Mt Barker’s pressure on the ball seemed to be somewhat lacking so we capitalized on that and created plenty of chances early on. It didn’t take long for us to find the back of the net as some strong build-up and a composed finish from John Kharel put us ahead. Our defensive pressure was good and we were able to break down most of Mt Barker’s attacking play, unfortunately some fancy footwork from one of their midfielders managed to net them an equalizer midway through the half. The Rangers replied by lifting our intensity and dominating possession, a lot of good attacking play lead to some great chances to go ahead again but unfortunately we went into halftime with the scores locked. The second half saw a much more even contest with Mt Barker coming out more composed and confident, they increased their pressure on the ball and looked much more threatening going forward. Defense at either end of the pitch was difficult to break down until the 85th minute when Pete Akakios from a mile out sent a cross towards the box only to somehow have it float perfectly over the keeper’s head and into the top corner of the goal. After a few last ditch efforts from Mt Barker the referee blew the final whistle, confirming the home side would hold onto all three points.